While our society has become more in tune with our local food systems and awareness on sustainability has grown immensely, we are still struggling with the issue of how to feed those, who for numerous reasons, do not have dignified access to nutritious food. Vancouver’s Neighbourhood Food Networks have become a key vehicle towards a more just and sustainable food systems in both the City of Vancouver’s Food Strategy and the Vancouver Park Board’s Local Food Action Plan. Vancouver’s Food Networks are networks of committed people across Vancouver focusing on food justice and resilience at the neighbourhood level. The creation of Neighbourhood Food Networks allows collaboration on food-based initiatives and programs. The mandate of the networks include growing local food in community and school gardens to connect people around growing food and to foster environmental stewardship; celebrations involving food to meet physical, spiritual, social and emotional needs, and increase community awareness around food security and reduce social isolation; food security initiatives such as drop-in meals, bulk buying clubs, mobile produce markets, and emergency food access and educational initiatives such as workshops lectures and films, advocacy, and research. You’ll find initiatives as diverse as that coming from the Westside Food Collaborative and there link with the Vancouver Fruit Tree Project Society and help coordinate public fruit tree picks and inter-generational food processing, to the South Vancouver Food Network ‘s partnership with BC Housing to provide programming for Kid’s Club, an after-school care program that works on building food skills such as apple sauce making. 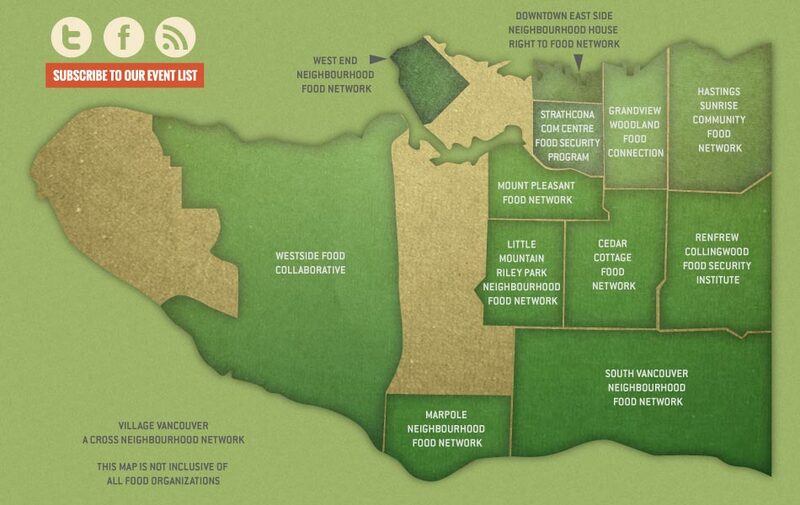 Check out the Networks on the map and head to www.vancouverfoodnetworks.com to learn how you can either collaborate, contribute or benefit from these initiatives.